In so many ways, Sargent Shriver is a philanthropic pioneer. 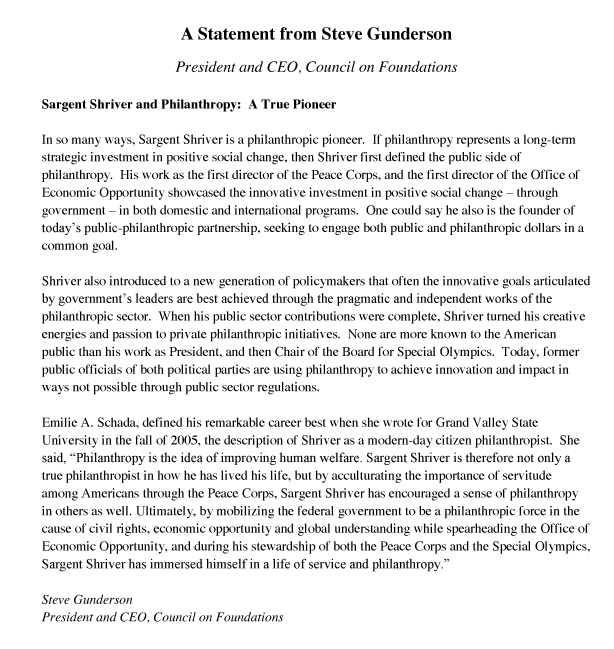 If philanthropy represents a long-term strategic investment in positive social change, then Shriver first defined the public side of philanthropy. His work as the first director of the Peace Corps, and the first director of the Office of Economic Opportunity showcased the innovative investment in positive social change -- through government -- in both domestic and international programs. One could say he also is the founder of today's public-philanthropic partnership, seeking to engage both public and philanthropic dollars in a common goal. Shriver also introduced to a new generation of policymakers that often the innovative goals articulated by government's leaders are best achieved through the pragmatic and independent works of the philanthropic sector. When his public sector contributions were complete, Shriver turned his creative energies and passion to private philanthropic initiatives. None are more known to the American public than his work as President, and then Chair of the Board for Special Olympics. Today, former public officials of both political parties are using philanthropy to achieve innovation and impact in ways not possible through public sector regulations. Emilie A. Schada, defined his remarkable career best when she wrote for Grand Valley State University in the fall of 2005, the description of Shriver as a modern-day citizen philanthropist. She said, "Philanthropy is the idea of improving human welfare. Sargent Shriver is therefore not only a true philanthropist in how he has lived his life, but by acculturating the importance of servitude among Americans through the Peace Corps, Sargent Shriver has encouraged a sense of philanthropy in others as well. Ultimately, by mobilizing the federal government to be a philanthropic force in the cause of civil rights, economic opportunity and global understanding while spearheading the Office of Economic Opportunity, and during his stewardship of both the Peace Corps and the Special Olympics, Sargent Shriver has immersed himself in a life of service and philanthropy."